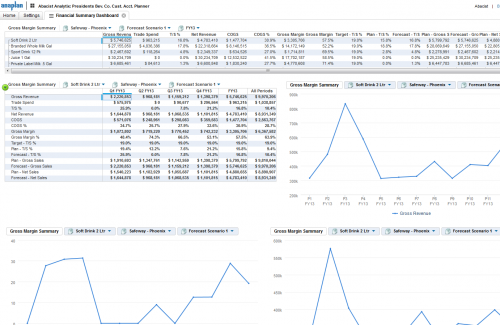 Rapidly adopt CPG revenue planning best practices. 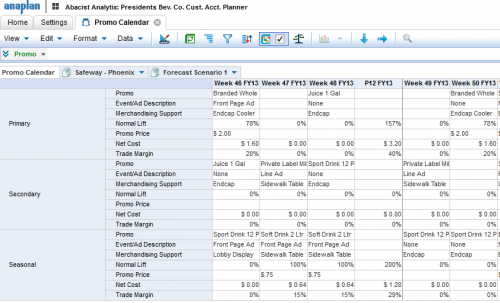 Generate a customer-level Revenue and Trade Spending forecast driven by weekly trade promotion activity including promotional pricing, feature and display plans. Incorporate both internal sales and shipment data and third party point-of-sale data for full insight into your revenue and trade spending plans. Pre-built Trade Promotion Calendar module enables rapid assessment of weekly trade activities including pricing, displays, and feature-ads. Common set of business rules & metrics fosters collaboration, but flexible enough to allow users to see information in a format meaningful to them. Flexible Anaplan platform enables easy model evolution and customization beyond the “out-of-box” Abacist Analytix solution. 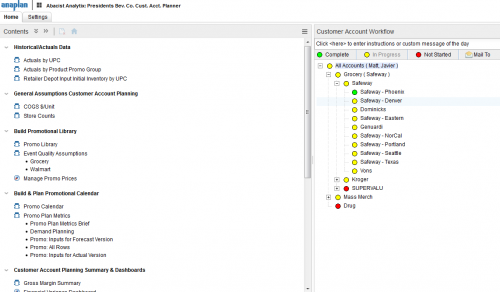 Single, common environment to manage customer accounts and product groups. Ability to secure & view data based on user’s areas of responsibility such as particular customers or products. 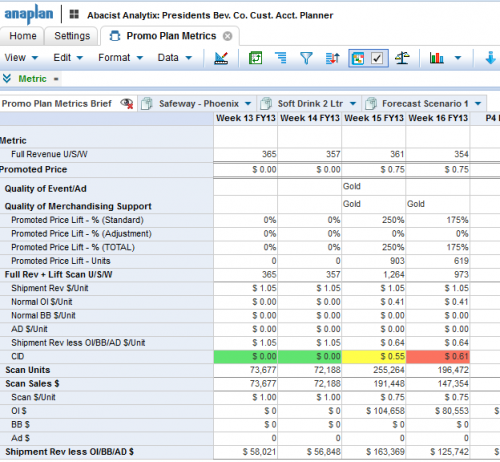 Seamless gap analysis to compare current forecast or actual results to original plans and targets. Easy data import from internal sales systems and point-of-sale including IRI or Nielsen. Scalable and flexible data hierarchies adaptable to changing product and customer lists. Incorporation of historical data to help generate easy insights. Visual dashboards are updated in real-time as planners change assumptions. Abacist Group is a management consulting firm helping clients grow sustainably. We offer our clients services to improve their Planning & Analysis including: Strategic Planning, Annual Planning & Budgeting, Forecasting, Demand Planning, Trade Promotion Planning & Analysis and FP&A.